This was my third London Marathon having run in 2010 and 2012 so I knew from the start that I already had one up on Mo Farah who was making his debut. I left Glasgow feeling confident and strong with a series of massive PBs under my belt after a great winter of training including many long runs with Dunoon Hill Runners. Kenny 1 vs Mo 0. I arrived in London on Thursday with fiancée Lisa in tow who was in town for a Hen Weekend. Writing this I am still not sure who suffered greater hurt or pushed their body closer to it’s physical limits – me covering the 26.2 miles or Lisa battling through 48 hours of extreme partying! Anyway more about the pain later! Day One was straight from the marathon preparation textbook as we went straight out to an Italian to carb load and then an evening of exhaustive sitting on my derriere as we went to see Charlie and the Chocolate Factory. The show was pretty good but not helped by failing to feature any of the songs from the movie until the finale. Pretty good day all round put me further ahead of the double Olympic Champion in my mind (and probably in Mo’s too – he kept talking about all the great African runners but I know he’d heard about my Innellan to Strone splits and was feeling the heat. You could tell I’d really gotten under his skin as he never mentioned me once in the press conferences). Kenny 2 vs Mo 0. On to Day Two and things started to get a little less than ideal preparation wise. I met a good friend of mine from Uni who was running his first London. Unfortunately he wanted to meet before work so I had to get up and brave the rush hour tube at stupid o’clock on a day off work. After a quick pit stop at a ‘greasy spoon caff’ we headed out to the Excel for the London Marathon Expo. This is a brilliantly organised event where each runner is required to register and collect their race number and timing chip in the days before the race itself. 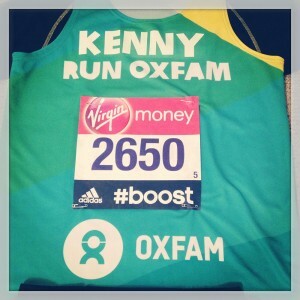 Despite repeatedly chanting the mantra ‘limit time on feet’ I had foolishly volunteered to help at the Oxfam Stand. I spent five hours on my feet all in and while it was good to reassure many of Oxfam’s first time runners it was hard on the legs. I’m starting to panic that I’ve drained my body of all energy by standing for too long! Come to think of it now maybe it was the 6 mile run on Thursday morning or the interval training with the Westies Cross Country Club on the Monday night that had sucked all the energy out of my legs – oh crap I’m really starting to panic about the race now. But butterflies are good, the adrenalin makes me run faster and this will surely put me closer to Mo! Bad day at the office – I need to write it off but I’ve let Mo back into the game and given him a glimmer of hope (I know he’s got people keeping an eye on me). Kenny 2 vs Mo 1. Lets call today a draw. My friend’s place is about a mile from the start which makes for easy and relaxed arrival on the morning of the race. 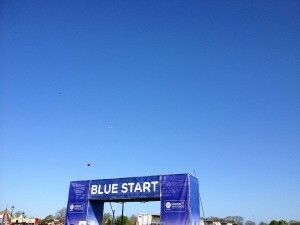 Although not my first time in London it was my first marathon from the exclusive Blue start (non-charity runner) courtesy of the ballot which saw me granted a place last September (the ballot for London 2015 opens on the 22nd of April for anyone who fancies it next year. This meant that I would be on the same start line as the elite men and more importantly I would be merging with the runners from the Green ‘Celebrity’ Start at mile 1. The start area at London is quite unique due to the size of the race – 36,000 runners. At the start of the process you are asked to give a predicted time and this correlates with your start pen. A few weeks ago I started to form a plan in mind of a target time for London and called the London Marathon office to check on this. Turns out I’d given a prediction of 3 hours and 45 minutes which saw me start in pen 5. Training had indicated a quicker time was on the cards and I planned to follow the 3 hours and 30 minute pace maker from Runners World. Unfortunately they were starting in pen 3. The superb organization at London thwarted all attempts to sneak into the higher pen so I had to make do with squeezing to the front of pen 5 which saw me right behind the 3 hours and 45 minute pace maker. At this point I should have assumed divine intervention and gone with plan b. The elite athletes were introduced to the crowd with the loudest shout of the day reserved for Mo himself. The gun fired and 2 minutes later I crossed the start line a big improvement on the 12 minutes to cross the line at the red start. Still incredibly impressive given the number of runners. In my mind I kept hearing keep it slow and steady but I was determined to use the first two miles to get past the two 3 hour and 45 minute pacemakers from the pen in front. Mile 1 was quite stop / startish as the road thins and people find their pace but clocked in at 8 minute 40 pace. Although slightly outside my 8 minute target pace I was happy that I had passed one of the pacemakers and that I was now getting into my stride. By mile 2 I had passed the second pacemaker and clocked an 8:14 mile. The first few miles are all downhill so I’d known before not to go off too hard but I was very conscious of clawing back time as I’d lost a minute of my target pace already. As a result the next few miles were all under 8 minute miles. A really fun part of the marathon is when the red and blue starts meet and run side by side for a mile before officially merging. There is a good bit of banter and heckling that helps pass another of the early miles. As usual the crowds were amazing and the atmosphere at Cutty Sark at the 6 mile marker was incredible. The live music was blaring and it was the first opportunity to wave for the official BBC cameras. Anyway after this everything went well until about mile 11. I had clawed back the lost seconds from the early stage and was bang on track for a 3 hour 30 marathon. This would be a 26 minute PB. Approaching Tower Bridge things started to feel strange though and I was getting a bit light headed and heavy legged. In the last two marathons I had felt really strong at this point and in hindsight it was a sign that things were not going well. The bridge is always a highlight of the marathon and when you come off you take a sharp right out to the Isle of Dogs and Canary Wharf. Usually at this point the very good club runners are coming back as the route backs up on itself at the 22 mile mark. I was delighted not to see any runners on the other side of the road and made it half a mile before Kipsang and Biwott came bounding down the road. It was great to see them as this is the one thing you miss being part of such a great race. A few runners later and a wall of noise started approaching from the distance. Seeing Mo and running within metres of him gave me a real boost to hand on at a time when I was starting to struggle. Miraculously Lisa had made it from her Hen night and was waiting at mile 15 as arranged. This kept me going from mile 13 to 15 when I was really feeling out of sorts. I knew Lisa was going to mile 19 and set myself another target to make it to Canary Wharf at just off marathon pace. The steel drum band at mile 18 saw me screech to a halt in a crushing blow to my race target. I didn’t walk at all in my previous race but I could not hold on any longer. After a couple of minutes I picked up to a jog but the next two miles were a walk / run strategy as I kept burning out. I saw Lisa and my pals again but I was totally done and hobbled away from them unsure about whether I could even keep going at this point. I saw the Oxfam cheer point at mile 20 and hugged countless strangers and summoned some energy to get moving for another mile. Around mile 22 I started to seize up again and had to move back to a run / walk pattern. The crowds at this point were awesome and I gorged on jelly babies and beans for a couple of miles. The first 3-45 pacer went by me somewhere around this point and I tried to get going again but I lost about 100 metres in about the course of a mile and still didn’t feel any better so resorted to a long walk to frustratingly recharge the batteries again. At this point someone drifted by and grabbed me by the arm into a slow trot which didn’t feel too bad and getting talking to him I was relieved to hear a friendly Glaswegian accent. Unfortunately he only managed another four or five hundred metres before he had to stop for a walk but I managed to grind out another half mile closer to the finish. I kept going at this point but by mile 23 I felt awful. The crowds were chanting my name as there were not many walkers at this stage of the race. Disappointingly I was passed by the second 3-45 pacer around this point and couldn’t get going to stay with him. Around this time I was handed a beer to rapturous applause outside a bar and decided there was no other way to drown my sorrows so I might as well indulge! The beer did not restore my energy and I only managed to run /walk my way to through the next mile. By 24 I knew the end was in sight and I ground out some more running just desperate to get to the end. Never had Big Ben looked so far away though and I was a sorry sight walking along the embankment, my legs cramping with every step. I stopped and stretched and high fived the population of London along this famous two mile stretch of the race. As you can see from the splits mile 26 was slow and painful but I did manage to pick up into a jog for the final stretch alongside Buckingham Palace in the Mall. Disappointingly I finished in 4-03 minutes which was way off target pace but I have learned about the importance of having a Plan B. When things are not going well reevaluate and attack a second goal in a race. I could have dropped in at mile 11 to the 3-45 pack and I am sure I would have held on. Realistically this was probably a better goal for me and maybe I could have kicked on from mile 20 if I had started in this group. Who knows. One thing is for sure I will find out as I will definitely be back! 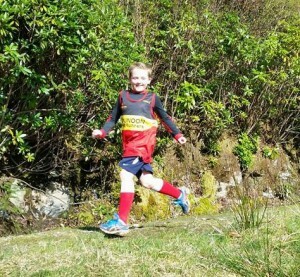 An excellent Breakfast Run was held on Saturday 19 April 2014, with runners of all abilities and ages coming along to enjoy the beautiful sunshine at Benmore Gardens. 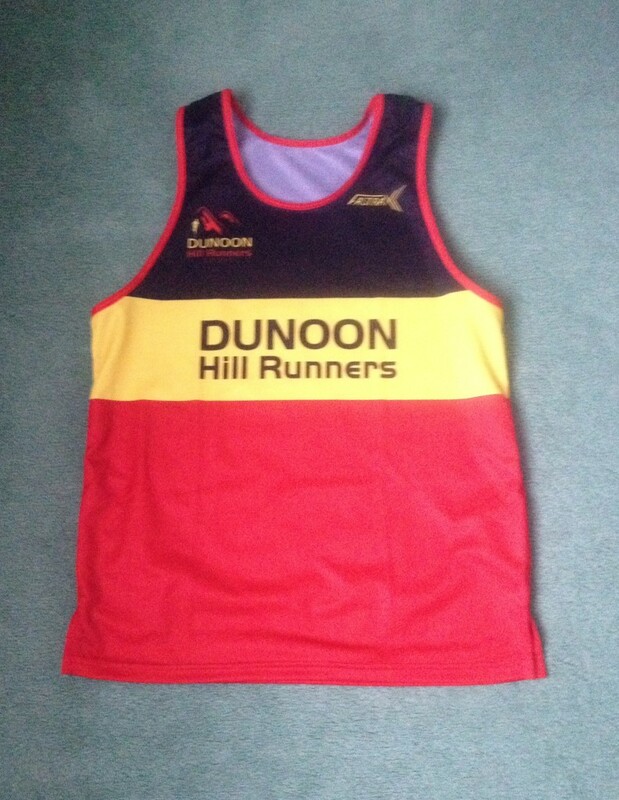 Everyone made it up the hill for a presentation of the new Dunoon Hill Runners vests. Easter eggs were to be found at the lookout on the way down, followed by breakfast at the cafe. The event was professionally photographed by Ken Clark, to whom Dunoon Hill Runners offer many thanks. Photos can be found here. Other photos will be added to the website shortly. Monthly Breakfast Run (Easter themed) this Saturday. All abilities from beginner to Mo welcome! DHR members who ordered vests will also be presented with these upon reaching the summit (view point)! 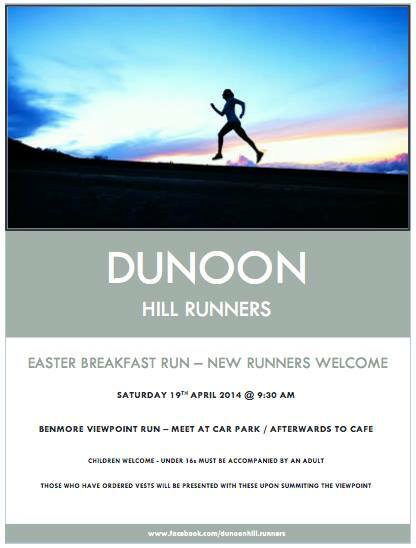 At a meeting held on Friday 28 March 2014, the Committee of the Dunoon Hill Runners was appointed – details here. An open invitation is extended to our second breakfast run. It will take place on Saturday 25 January 2014 at 10 am at Benmore Gardens. The cost is free. Children under 16 must be accompanied by an adult. The run will be as easy or as hard as people wish and there will be lots of encouragement from our regular runners. Afterwards, we will meet at the Cafe where there will be an opportunity to chat to group members.